The marquee free agents this offseason are easy to name -- but none of them are coming from teams in the Pacific Division. That doesn't mean there aren't valuable players available from the West Coast. Stars hitting the open market are few and far between in the Pacific, but the division was one of the tightest in the League, produced three playoff teams, and is home to the reigning Stanley Cup champion Los Angeles Kings. That's because these teams are rich in the nuts and bolts that make up a contender. The free agents from the Pacific may not be the hottest names on the market -- though one of them is a no-doubt Hall of Famer -- but when a team wins a championship, it's often because it is a deep outfit that can roll four lines with confidence and do the little things correctly. The Coyotes, Sharks, Stars, Kings and Ducks have several solid point producers preparing to test the free agent market starting July 1, and if their rosters look very different when the dust settles, it will be because the top players in the Pacific who hit the market had plenty to offer. There are solid defensemen, veteran leaders, scorers and grinders all looking for new deals, and these 10 players will play a huge role in shifting the balance of power in the division if they wind up with new homes. By the time the 2012-13 NHL season begins, Langkow will be 36 years old, and the seasons in which he regularly topped 50 points while playing in Calgary will be long behind him. But make no mistake -- Langkow can be a valuable piece for a team that either needs veteran leadership or is one or two players away from competing for a championship. With Phoenix last season, Langkow had 30 points while playing an average of more than 15 minutes per game and doing the unglamorous things that help teams win, like hitting and blocking shots. Langkow did all of this without spending significant time in the penalty box -- he had 14 penalty minutes. Add to that Langkow's 15 full seasons of NHL experience and the fact he's never won a Stanley Cup and it's clear he not only can be a player who helps teams by knowing the nuances of the game, but also one who will bring a burning desire to win. It's remarkable that in a season in which Penner got his name on the Stanley Cup, the biggest headlines he inspired had to do with an injury he incurred while eating pancakes. During the 2012 Stanley Cup Playoffs, however, Penner showed himself to be significantly more than a punch line. In 20 playoff games, Penner scored three goals, added eight assists, and was plus-4, the sixth-best mark among Kings forwards. Penner is a proven contributor to two Cup champions, he brings a tremendous amount of size at 6-foot-4 and 242 pounds, and he'll be 30 years old at the start of the 2012-13 season. Though he may not get close to the five-year, $21.25 million contract he just finished, Penner is going to be a valuable player with plenty of suitors. Whitney may have turned 40 during the postseason, but during 2011-12 he certainly didn't play like someone nearing his retirement. In 82 regular-season games, Whitney had 24 goals and 53 assists, sixth in the League. Those 77 points were 12th in the NHL and tied a career-high -- and considering his 20 years and 1,229 games in the League, that's impressive. Though many older players are likely to see their salaries come down as they reach their late 30s or early 40s, Whitney might be one of the few who sees his go up, and not only because he's coming off his second 77-point season after the age of 35. With a plus-26 rating last season, Whitney also posted the best two-way mark of his career. Add to that his Stanley Cup championship experience, and the Wizard might be cashing in. As the Coyotes' captain, longest-tenured player and the only member of the team who played with the franchise when it was in Winnipeg, it's hard to imagine Doan in another jersey -- but now that he's about to hit free agency, the prospect is out there. Doan will turn 36 in October but still consistently is churning out 50-60 point seasons. In 2011-12, he had 22 goals and 28 assists, the 11th time in his career he's hit the 50-point mark, a number his offensive totals haven't been below since 2002, when he finished with 49 points. This past season was the 11th time in the past 12 Doan scored at least 20 goals, so he has plenty to offer in terms of offense. 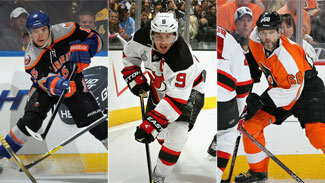 His veteran experience also likely will be coveted; he won the 2011-12 Mark Messier Leadership Award. It seems most likely Doan will be back with Phoenix, a team that appears to be trending upward as he searches for an elusive championship, but if another Cup contender comes in with a big offer, don't be surprised to see Doan's steady production leave the desert. When it comes to Selanne, there are no secrets. We all know what he can do, we all know he one day will be in the Hall of Fame, and we all know that if he chooses to return for the 2012-13 season, as has been reported in his native Finland, it almost certainly will be with the Ducks. Selanne will turn 42 in July, but like Whitney he remains an offensive force. He had 66 points in 82 games for the Ducks in 2011-12, and his minus-1 rating is impressive considering Anaheim's minus-27 goal differential. Selanne earned $4 million last season, and if he chooses to return he likely will receive a similar deal. As a player who remains an above-average point producer and who is beloved by the Ducks' fan base, there really is no one who can lose if Selanne plays another season. It seems in this case whether or not Selanne is back in Anaheim will be his decision. With 13 points last season, Rozsival did not give the Coyotes much in the way of offense, but he is about as steady as they come in terms of solid, stay-at-home defense. Rozsival was a key contributor to Phoenix's blue line, putting up a plus-8 rating, which has been standard for him. In fact, Rozsival has finished with a negative plus/minus once since 2005-06. If there is a significant knock on Rozsival, it could be that he has struggled to stay healthy in recent seasons, which has affected his offensive production. While with the Rangers from 2005-06 to 2010-11, he had four seasons of more than 30 points, but in the past three seasons his numbers have tumbled along with his games played. Rozsival has played a total of 119 games over the past three seasons, which could scare away some teams. But when healthy he has proven to be a solid defenseman. After Souray spent the entire 2010-11 season in the American Hockey League due to a contract dispute with the Oilers, he was given a second life with the Stars in 2011-12. Though he manages to stay healthier than he did during his three seasons in Edmonton, Souray's 21 points in 64 games were below his personal standard. That said, his defense still was strong. Souray was plus-11 for Dallas, which was the best plus/minus he had put up since a plus-18 in his rookie season in New Jersey 14 years ago. Souray's solid play on the blue line and offensive potential could make him a bargain for someone if he can rediscover his offensive touch. Even if he doesn't, there is no denying that at 6-foot-4 and 237 pounds, Souray brings the kind of size most general managers want on defense, and that alone likely will get teams calling. Aucoin's offensive numbers have declined steadily in each of the past four seasons, but he remains a solid defenseman who can be an asset on a contending team's blue line. Aucoin has been a plus-14 and a plus-18 in his past two seasons in Phoenix, providing the kind of experience that could help several young teams that need a steadying influence. It is worth noting that Aucoin will turn 39 in July, which means any financial commitment a team makes isn't likely to be a long one. That could be good and bad for Aucoin -- it may give him more options, but also could eliminate teams looking for long-term blue-line solutions. As he continues to search for his first championship, Aucoin has plenty he can bring to the table. No team would seem to know this better than the Coyotes, so there is a strong chance he will be back in Phoenix this fall. Burish is not a glamorous player. He never has scored more than eight goals and never has had more than 13 assists in a season. He is better known for his brawn than his offense, with 490 penalty minutes in 297 NHL games. But Burish's physical edge also made him a winner in his professional and amateur career. Burish was a key cog for the Blackhawks during their 2010 Stanley Cup championship, and he captained the University of Wisconsin to an NCAA title in his senior season of 2005-06. All of that winning is no coincidence. Burish has been a plus player in each of the past four seasons, including two seasons in Dallas when the Stars had a negative goal differential. In 2011-12 he posted the best rating of his career at plus-6. With a salary cap hit of $1.15 million over the course of his prior contract, Burish likely will be a relatively inexpensive addition for some team. His physical edge could be a useful quality for a Cup contender. Moore doesn't stay in one place for very long. His trade to the Sharks last season marked the ninth time he had suited up for a new team in eight NHL seasons. Though he does move frequently, he is a valuable contributor to a winning club. Moore mostly has been known as a pest, but that kind of play pays dividends, evidenced by the success of each of his recent teams. Moore has been on a different team each of the past three postseasons, but two of them, Montreal in 2010 and Tampa Bay in 2011, each went on an unexpected run to the Eastern Conference Finals. In 2011, Moore had 11 points in 18 playoff games with the Lightning. Over the past two seasons, he's earned an average of $1.1 million, which means he could be a bargain for a playoff team that needs someone to grind in the corners in the playoffs.